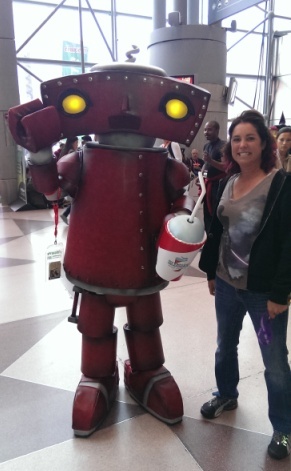 Two weeks ago I added a new convention to my list of amazing fandom experiences: New York Comic Con. The four days of interesting panels, meetings with old friends and making new ones, and braving the crowds were just as memorable as I’d hoped. Megan has already talked about the Star Wars Rebels panel. Look for a photo album on Fangirl Zone on Facebook soon. For now, I’ll recap my highlights from the con. Falling Skies Panel: After spending Thursday exploring the show floor when the crowds would be at their lightest, the first panel I attended was Falling Skies at 12:15 on Friday. I’ve watched the show since the first season, and I also wanted to scope out the Empire Stage before the three panels I planned to see there on Saturday. Right before the panel AriZona Tea ran an incredibly sexist and tasteless “Big Cans” promo video. I saw a number of tweets slamming the ad, and I couldn’t have agreed more. Worse, the man next to me was shouting out what he would do to the actress once she returned to the stage. With the con packing fans in side by side, this certainly created an uncomfortable situation. Thankfully, the ad was no longer running on the later days of the con. On to the panel: new showrunner David Eick, probably best known for his work on Battlestar Galactica and Caprica, talked about the writers’ vision for the show in its upcoming fourth season. One of their main inspirations is The Empire Strikes Back: rather than having the heroes work together as a team, they’re separated into different storylines and have to fight to reunite with each other later in the season. The panelists also discussed the creature work on the show, including the Skittters and the Volm, and noted that the feedback from fans urged more practical effects instead of CGI characters. The Skitter head has about two dozen servomotors to animate the alien’s movements, and the Volm mask is practical with only minor overlays of CGI to enhance the details of the facial expressions. One major recurring theme of season four is the moon, and the teaser included the tagline “When all is lost, let the moon be your guide.” Leaving the panel, fans received small light-green squeezable moons as the freebie swag. Female Protagonists Rock the Con: After Falling Skies, I’d planned to attend the panel titled “Kill or Be Killed: Crafting a Powerful Female Protagonist” in one of the smaller panel rooms. The line was long, spilling well beyond the allotted queue for the room. When the prior panel let out, a good number of fans were able to get in – but I’d estimate at least 150 more (including me) were unable to be seated. Hopefully NYCC’s organizers noticed the high interest in the topic, and will give female characters and their fans more seat-space next year. The Legend of Korra Panel: I got up early and hustled to the queue hall to be sure I’d be inside the con first thing in the morning. 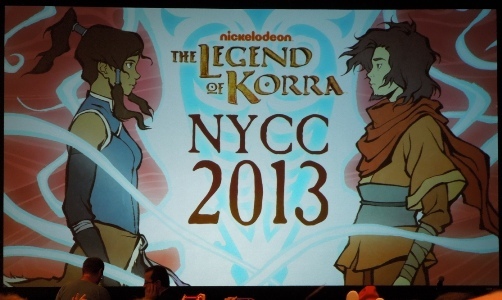 Fortunately my efforts paid off, garnering pretty good seats in the middle section for what turned out to be a literally standing-room-only crowd for Korra’s first appearance at NYCC. Fans were treated to a screening of the October 18th episode, featuring the origin story of Wan, the first Avatar. The discussion with co-creator Bryan Konietzko, executive producer Joaquim Dos Santos, and voice actors Janet Varney (Korra), P.J. Byrne (Bolin), and Steve Yeun (Wan) was insightful, humorous, and engaging. Particularly noticeable was their consistent emphasis on their interactions with the show’s fans as a means toward making the show as enjoyable for their audience as possible. Fan art earned special mention, with the creators and actors noting how much it inspires them to see fans’ imaginations spin out beautiful work from their time spent with the show. In fact, three fan artists have been hired to work full-time on the series. The panel concluded with a fascinating behind-the-scenes look at the process of creating an episode of Korra, from writing and initial designs through storyboarding, animation, recording, and music. The brief clip at the end included voice work from Dee Bradley Baker, a favorite of mine. And we learned that a single episode of Korra contains over 15,000 drawings. Wow! Once Upon a Time Panel: Creators Eddie Kitsis and Adam Horowitz opened up about their goals for both the newly launched Once Upon a Time in Wonderland, which premiered the Thursday night of the con, and the original Once Upon a Time series, which began its third season in the wilds of Neverland. Actress Jennifer Morrison (Emma Swan) joined them for the second half. I especially liked the description of Wonderland as “an epic love story in a trippy world” and Emma as a “protective mama bear with a sword.” Like the prior panel, they were equally effusive about the importance of the fans to their projects. Fan art again received specific mention, and some favorite fan art actually hangs in the creators’ office; Kitsis said, “we love it, we encourage it, send it to us.” They share it in the writers’ room, too. The panelists also emphasized the importance of ‘shippers as drivers of fandom. Morrison listed by fandom label the top three ‘ships people ask her about – SwanQueen (Emma/Regina), Captain Swan (Emma/Hook), and SwanFire (Emma/Neal) – and described ‘shippers and other fans projecting their enthusiasm onto the show as “us doing our job.” Horowitz added, “we may write it, but it’s your show.” The panelists likewise acknowledged fan concerns, raised in the Q&A segment, about the lack of LGBTQ representation in the show, noting the show is about love in all its forms, and Morrison urged fans to keep watching. For a view from the panel’s moderator, Matt Mitovich from TVLine, check out his recap at their site. While the animation is still in its earliest stages – Hidalgo mentioned that Dave Filoni is in Asia right now to work with the overseas animation teams – clearly a great deal of work has been done on the story and art design of the series. Hidalgo’s discussion of the Empire’s expansion into the Outer Rim, the planet Lothal’s past and the lure of the Empire’s offer to improve its prospects, and the ultimate exploitation of the outlying regions by the central government draws heavily on real world history and politics from ancient empires like Rome and China to modern powers like colonial Britain, the Soviet Union, and the United States. Although George Lucas was specifically mentioned on only one point – for his explanation of why stormtrooper recruits are more patriotic and obedient in the Empire’s new order than lab-grown clones – these sorts of historical analogies point directly to the same kinds of influences that shaped the six Lucas movies. The videos on the creation of Rebels were full of great hints and teases, but it would have been nice if we’d seen more women’s faces. I noted only two, a producer and an artist, while the key creators shown – the three executive producers, a member of the Story Group, and the art and visual effects supervisors – were all middle-aged men. 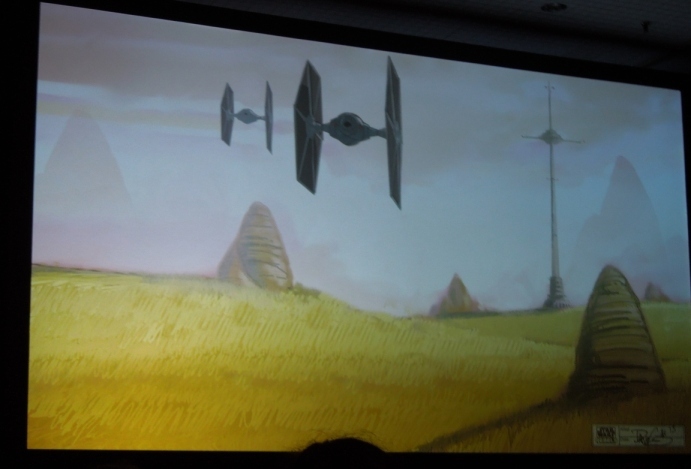 The panel ended with the introduction of a key villain in Rebels, an Imperial Inquisitor. Wielding a double-bladed red lightsaber, this agent works for Darth Vader and is sent to pursue leads of possible surviving Jedi. So although Rebels presumably won’t have a Jedi lead character like The Clone Wars did, it seems the Empire at least thinks there might be a Jedi at work on Lothal, if it’s sending an Inquisitor to the planet. Similarly, Hidalgo made note of the fact that the Inquisitors were first introduced in a 1987 roleplaying game manual. (Thanks to Wookieepedia’s entry, I learned the book was The Star Wars Sourcebook from West End Games.) With the number of recent references to the Story Group working to attain synergy among Lucasfilm’s projects in development, including Episode VII and Rebels and others, perhaps Expanded Universe fans can find cause for cautious optimism in the use of an EU creation, rather than a completely new invention, as a key character in Rebels. I recorded my thoughts immediately following the panel and shared them with Dan and Cory at Coffee With Kenobi for their Rebels Reactions #2 Episode. The Making of Return of the Jedi Panel: On Sunday, my final panel of the con was J.W. Rinzler’s discussion of his latest Original Trilogy study. The photos and videos were great fun, and even though I have the hard-copy book it’s now very tempting to pick up the enhanced ebook edition, out today. Rinzler’s anecdotes from researching the book and his experience with George Lucas were a treat, too. The moment that made the entire audience laugh aloud, though, occurred when a young boy approached the microphone during the Q&A, asked if Rinzler had edited the Star Wars Character Encyclopedia (which he had), and promptly announced that he had found six mistakes in the book. Rinzler handled his response deftly and politely – and also bemusedly mentioned Leland Chee’s responsibility for fact-checking the books against the Holocron database. It sounds like the Holocron Keeper may have some competition on his hands! Networking, Mingling, and Mentoring: As great as the panels were, the true highlight of the con was catching up with old friends, meeting internet friends in person, and even making a few new ones. 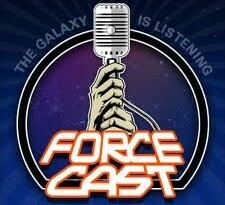 I caught up with Jay Shepard of Jedi Journals and Aaron Goins of Star Wars Bookworms for the first time since Celebration VI last summer, as well as the Del Rey booth crew. 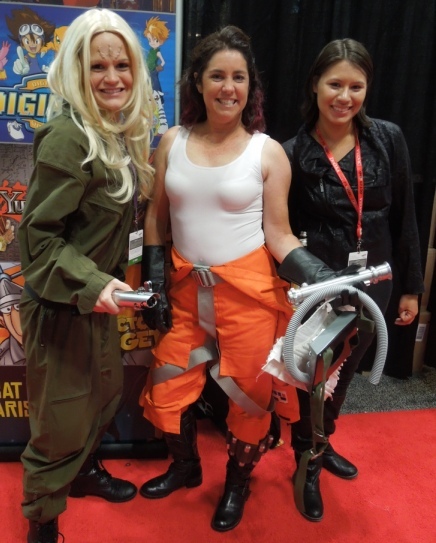 I got to meet FANgirl contributor Megan Crouse for the first time in person, and introduce her to Ashley Eckstein, Jason Fry, and Ryder Windham. I also met Johamarie Macias from The Wookiee Gunner and we chatted with Ashley, too, where we learned the Millennium Falcon pencil skirt will be out soon! On Thursday, Shea Standefer and I had a great dinner to discuss Wynde and the visual look I have in mind – and there was some banter about the Star Wars EU and Jaina, Jag, and ‘shipping them, of course. On Friday night, Erich Schoeneweiss organized a mini-Celebration that included author John Jackson Miller, Del Rey’s Frank Parisi, artist Jeff Carlisle, and Lucasfilm’s Matt Martin. On Saturday, Megan and I had a lovely dinner, and our discussion spilled out onto the streets of New York afterward. At the same restaurant, we met geek girl extraordinaire Amy Ratcliffe and Christian Blauvelt, formerly of Hollywood.com and now with the BBC. Shea also let me borrow her X-wing pilot costume again, this time worn around the waist with a white tank like the Kotobukiya bishoujo statue. That led to two great moments. 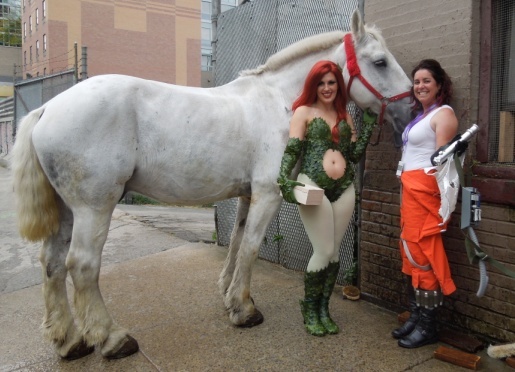 One was me as Jaina and Shea as Poison Ivy posing with a white handy-cab horse we met on the street between her hotel and the convention center. The other was meeting two big Star Wars EU fans, Rachael and Rocky, cosplaying as Tahiri Veila and Mara Jade; they recognized the Jaina costume and ran over to introduce themselves. Rachael and Rocky met in college and became friends over their mutual fondness for the New Jedi Order. The three of us engaged in much opining on EU topics, including whether the revelation that Vergere is a Sith damaged a brilliantly designed character. I’ve tempted Rocky with an opportunity to share her thoughts after she and Rachael shared similar experiences to my own back in the TFN message boards days of being drummed out of Literature discussions and having to take their opinions to the Fanfic discussion forums, where they felt safer. As it turned out, we knew each other from Tumblr. It was fun to make new Star Wars friends. 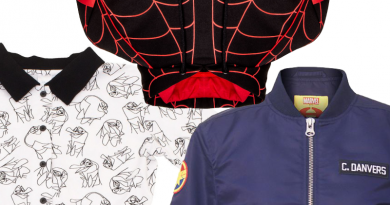 Tricia Barr took her understanding of brand management and marketing, mixed it with a love of genre storytelling, and added a dash of social media flare to create FANgirl Blog, where she discusses Star Wars, fandom, and strong female characters. She also writes about Star Wars for Random House’s science fiction and fantasy blog Suvudu.com and Star Wars Insider magazine and is a contributor for Her Universe’s Year of the Fangirl.